Burt’s Greenhouses is a family owned business located in Odessa, Ontario, Canada (near Kingston). Brian Burt and Ruth Hayward started the business in 1981, and they grow and sell annuals, perennials and shrubs directly to consumers as well as through garden centers. In the winter their heating requirements are 50,000 square feet (4,600 m2) of greenhouses, heated by hot water from pyroylized biomass. 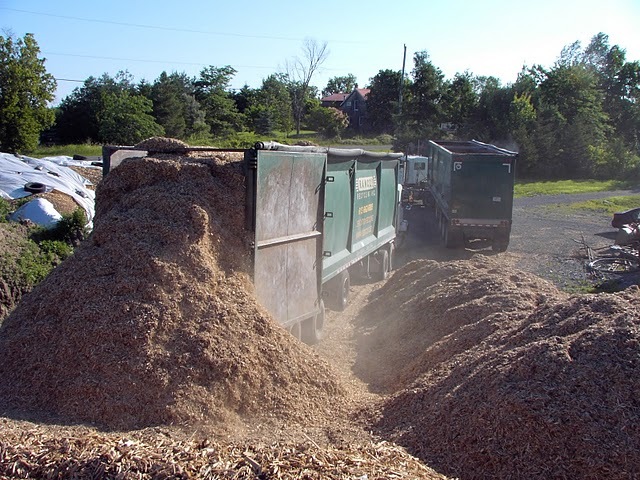 The biomass feedstock consists of wood waste, mostly from used shipping pallets and “clean” construction waste (i.e. wood not treated with heavy metals or other toxic substances). Brian and employee Alex English, who had previous experience with pyrolysis technology, have been inventing and modifying current hardware (and software!) to improve the efficiency and cleanliness of their continuous pyrolysis process and allow the production of biochar. The chipped wood feedstock is kept in a covered storage area and is fed into the grate stoker (pyrolysis unit) by computer-controlled augers and conveyer belts. All the air supply inside the stoker is controlled both under and over the fuel. To achieve constant air supply, Alex and Brian installed an air lock and better valves on the stoker. Above-fuel air input is automatically controlled using real-time input from an oxygen sensor in the smoke stack. The net effect of these changes to air supply is an optimization of the fuel to air ratio resulting in the lowest possible emissions and highest possible efficiencies. By increasing the grate speed and reducing the amount of under-fuel air, the process can produce varying amounts of biochar (0 – 23%). It is estimated that if biochar is valued at twice the price of the biomass feedstock, the sale of biochar can fully offset the cost of the feedstock. Burt’s Greenhouses are actively pursuing the optimization of this system with an eye toward producing biochar on a continuous basis during their normal heating season. Brian has begun testing his biochar material and using it experimentally in potting mixes in his operation, and also offers small amounts of biochar for sale. He is looking into the cost of producing biochar vs. heat in terms of feedstock, the quality of feedstock required, and what biochar would need to sell for to make it a viable product for the greenhouse. Lessons Learned: Alex and Brian think that the installation of the stack gas analyzer to measure CO and O2 was an essential development tool, allowing them to automate and optimize the process of heating and biochar production. Greenhouse operations are heavy users of fossil fuels—usually in the form or natural gas or oil. By using biomass, these operations can come closer to being carbon neutral. By producing biochar in the process they could actually become carbon negative. The goal of this effort is to prove the viability of co-generating heat and biochar, and to develop a marketable biochar product (which can also be tested and showcased on site). 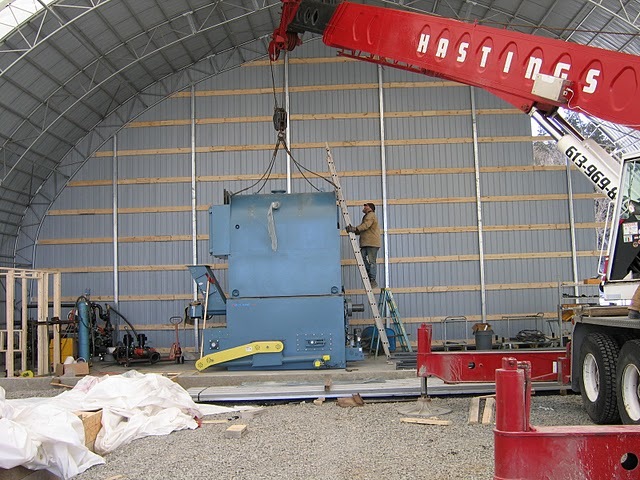 Installing the boiler at the greenhouse; photo courtesy of Burt’s Greenhouses.